The lives of George Ratchford and James Ritchford/Richford form the strangest sibling story of early Skagit County. If you read the 1906 book, Illustrated History of Skagit & Snohomish Counties, you will find biographies of both George Ratchford and James Ritchford. James was 14 years older, born in Hawksburg, Ontario, Canada, on July 23, 1850. Their stories about growing up in Canada are identical except for the spelling of their father's last name: for James, it is Ritchford; for George it is Ratchford. We wondered if they could have had two different fathers, but the name and the year the father died — 1876, is the same. James is listed as the fourth child and George as the eighth and youngest. George Ratchford at his anvil in his blacksmith shop. Photo courtesy of Cecil Hittson. Three questions arise: did they have a fight of some kind; which was the original spelling; and if they did have a feud, why did they wind up in the same city? None of the descendants who have contacted us know. And the name mystery continued. Sometime after the 1906 Book, James Ritchford changed his name again to Richford. But his burial record lists him as Ritchford. Just to complicate the story even further, he lists his father's Christian name as John while the 1906 biographies lists the father as William. James emigrated from Ontario to California in 1874 at age 24, worked in forests and mines and married Addie Findley in 1883. They soon moved to Washington and James took his family up the Skagit River in a rowboat to Sterling. James went to work in the woods and for the Sterling Mill Co. for seven years, maybe working originally for Jesse Ball or Winfield Scott Jameson. In 1890, the same year that George Ratchford arrived in Sedro, James bought a 90-acre farm near the Seattle & Northern railroad tracks and did well until the back-to-back floods in the fall of 1896 and the spring of 1897. Their house and farm was demolished and they had to rent a nearby house temporarily on the Jesse Ball homestead while they rebuilt. Then in 1905, James joined V.A. Marshall and William Hurley to lease out the old Sterling Mill Co. and bring it back into full production, this time as a shingle mill. The Hurley, Marshall & Ritchford Company revived the mill because Sterling was the terminus for the new Puget Sound & Baker River Railway, a partnership of Ed English and the Dempsey brothers from Michigan, who shipped logs down from upriver and dumped them into the Skagit to be rafted to markets. In the 1906 Book, we learn that both James and Addie were very active in the Order of Pendo, that they were Presbyterian and that he was Independent in politics. He also served on the Sedro-Woolley school board. A very brief July 29, 1937, obituary in the Sedro-Woolley Courier-Times for Jim Richford does not explain the name mystery but does note that survivors included brothers George and Emery of Sedro-Woolley. Richford moved his family to Reed street in Sedro-Woolley in 1906 and sometime after that he began a greenhouse on his lots. The obituary notes that he pioneered that business here. He was 87 when he died at the home of his daughter, Florence Marihugh. She and her husband, Lloyd, owned the grocery store on State street that is now called the Handy Mart. George Ratchford was born in Montreal on April 17, 1864. When Ratchford moved from Mendocino, California to Sedro in 1890-91, he worked for a mill, probably the one owned by David Batey and Joseph Hart. He practiced his trade as a blacksmith for 18 months and then barked logs, first for Smith and Bechtel and then for Matt McElroy, until he had an accident. In 1893 he became a teamster for the Hightower brothers and worked for them for three years. In 1896 he became a partner with the Hightower and Kirby Logging Co., contracting shingle bolts for the Green Shingle Mill, first in Burlington and then at the Cokedale Junction in the Skiyou area. 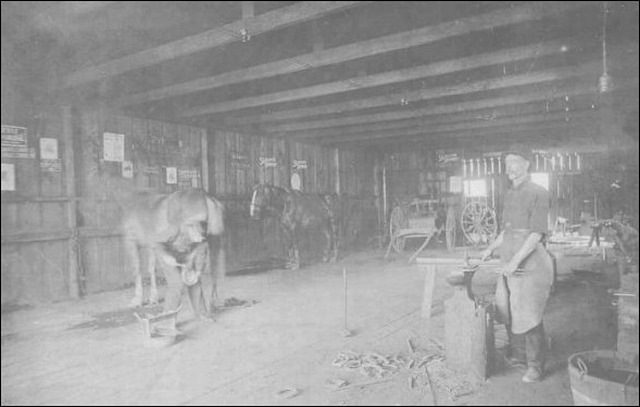 When his partners bought him out in 1899, he set up a blacksmith shop somewhere in old Woolley, maybe as a partner with William J. Thompson. We know very little about Ratchford's life after that except that the 1905-06 Polk Directory lists him as a blacksmith with partner James McCabe. Researcher Roger Peterson thinks that he joined Frank Hoehn's stable company after the great Woolley fire of July 1911. This seems to be borne out by his Courier-Times obituary of Jan. 6, 1944, which noted that his blacksmith shop stood where the Donnelly garage was located at the northeast corner of Ferry and Murdock streets. That is where Hoehn moved his business after it burned to the ground during the fire. Ratchford was buried with full Odd Fellows honors and Rev. Milo Morris conducted the ceremony. The obituary states that Ratchford was a 50-year member of Morris's church but the church denomination was not named. Ratchford was survived by his wife, Clarabelle and two sons, Floyd of Vancouver, Washington, and George Jr. of Seattle, and his brother, Emery R. Ratchford of Sedro-Woolley. Clara died just five months later on Oct 22, 1944. She was also buried in the Odd Fellows cemetery and the Rev. W.D. Griffin of the Methodist church officiated, so maybe George was also Methodist. Clarabelle was born in Elkhart, Indiana, on Oct. 10, 1877. We hope that a descendant of one of these family lines will contact us with more information and photos, especially the Ritchford/Richfords. For more information on James Ritchford/Richford, you can read the obituary of his daughter, Florence (married name Marihugh). And see this site for the story of Bayview pioneer Silas Marihugh. This story will soon be changed to this address. If neither file connects, please email us. See our Check out Sedro-Woolley First section for a list of all the features about the town's businesses and pioneers.